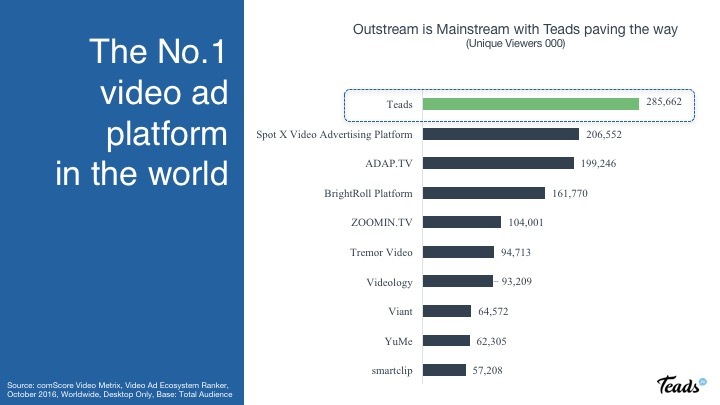 Teads remains on top of comScore’s video ad ecosystem standing strong above the industry’s largest players. Continuing to exceed Spot X, ADAPT.TV, BrightRoll, Videology and YuMe, Teads takes its place as leading marketplace in the world. As of October 2016, Teads reaches 285,662,000 unique viewers worldwide (desktop only). According to Teads’ servers, the company’s total reach is even bigger at 1.2 billion unique users, including 720 million on smartphones. comScore also released the Japan Desktop Online Video Rankings, and we are thrilled to be ranked as Top 3 Online Video Properties by Unique Viewers sitting just below Google Sites and Yahoo Sites. This is a huge success as Teads has recently entered the APAC market opening offices in Seoul, Singapore and Tokyo. Outstream is making strides in all markets worldwide and Teads is continuing to lead the way!